How can a society prevent-not deter, not punish-but prevent crime? Criminal justice prevention, commonly called crime control, aims to prevent crime after an initial offence has been commited through anything from an arrest to a death penalty sentence. These traditional means have been frequently examined and their efficacy just as frequently questioned. Promising new forms of crime prevention have emerged and expanded as important components of an overall strategy to reduce crime. Crime prevention today has developed along three lines: interventions to improve the life chances of children and prevent them from embarking on a life of crime; programs and policies designed to ameliorate the social conditions and institutions that influence offending; and the modification or manipulation of the physical environment, products, or systems to reduce everyday opportunities for crime. Each strategy aims at preventing crime or criminal offending in the first instance - before the act has been committed. Each, importantly, takes place outside of the formal criminal justice system, representing an alternative, perhaps even socially progressive way to reduce crime. 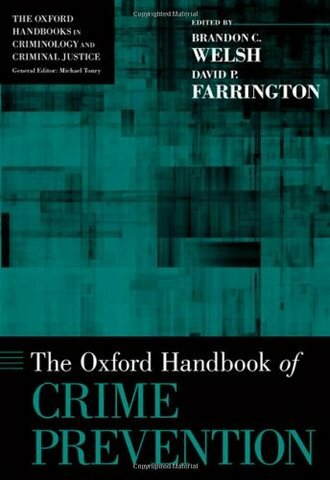 The Oxford Handbook of Crime Prevention is a comprehensive, up-to-date, and authoritative review of research on crime prevention. Bringing together top scholars in criminology, public policy, psychology, and sociology, this Handbook includes critical reviews of the main theories that form the basis of crime prevention, evidence-based assessments of the effectiveness of the most important interventions, and cross-cutting essays that examine implementation, evaluation methodology, and public policy. Covering the three major crime prevention strategies active today-developmental, community, and situational-this definitive volume addresses seriously and critically the ways in which the United States and the Western world have attempted, and should continue to strive for the prevention of crime.